it all started a few months ago, I got a friend request for a company called Taurus Bass Amp. I accepted, curious to know what they wanted. We got chatting and I saw their amps and pedals and they looked awesome. I chatted some more to the lovely and helpful Ania and very soon an endorsement deal was on offer. But before I agreed to anything I needed to hear them...I found out that they were at the London Bass Guitar Show along with our Guitar endorser's Mayones. So myself and Fi took a trip over there to meet the guys. We meet with Maciej Kończak from Mayones and Micheal and Ania from Taurus. I tried out the pedals, we had some laugh and all in all it was a great trip to meet some great guys. I could not get a good feel for the pedals, I knew they sounded good, but because of the noise in the arena, it was hard to judge. I took the fantastic endorsement and bought the Abigar Multidrive and the Tux Compressor. I waited with baited breath and finally they arrived. I brought them down to our studio, plugged em in, set em up, and let rip. What I got, I was not expecting. As soon as I picked my face back off the floor, I realised I did not have two god like pedals, but I had two holy WEAPONS!!! Let's look at the Abigar Multi Drive. I have a very discerning taste when it comes to Bass distortion. I have never really heard one I liked. Sure there where elements of some, tone here, grit there, but as a whole none ever grabbed me until now. The Taurus Silver Line Abigar Multi drive is unreal. 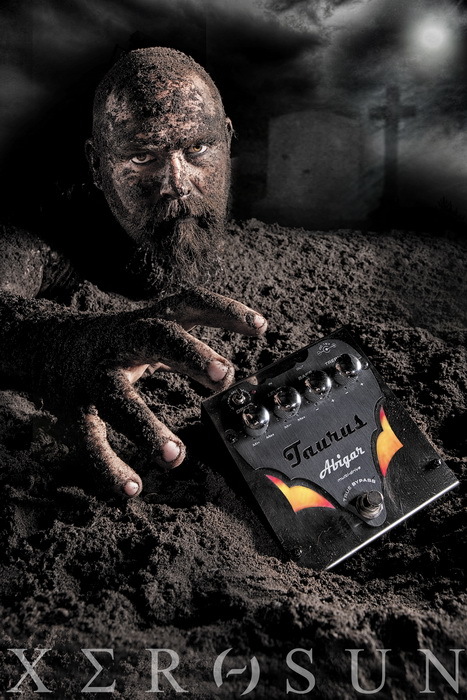 It can go from simple "dirt" in your tone, to face melting eye burning metal power!!!! I mean this thing is lethal, I am now armed and dangerous! My Bass tone has been turned into a raging monster with bone crushing, soul meting power, I was gob smacked. If I was to lead an assault on an attacking horde, I would level them with the Abigar! The Taurus Silver Line Tux Compressor/Limiter is basically a nuclear reactor in a stomp box. Not only did it even out my Bass tone, but it brought it to a whole new level, and then propelled it in to the stratosphere! Adding a myriad of dimensions and possibilities to my tone, this is the pedal God would use if he played Bass. So in short, I am telling every Bass player out there the one and only distortion pedal you should EVER own is the Taurus Silver Line Abigar Multi Drive. And if you want to smooth out your tone and then ram it down the throat of anyone in the neighbouring ZIP code, the Taurus Silver Line Tux Compressor/Limiter is a must. These two pedals have now earned pride of place on my pedal board where they shall stay forever. Check out Taurus below...tell em Ives from XEROSUN sent ya.